Joe Romm did not like it, nor its message. May be I am less exigent or just am lucky enough to enjoy most of the times I go to a cinema (scarcely nowadays, it is a pity), I enjoyed it and consider it valuable to make us think about climate change. Why ? Because even if the story is not terribly original it is easy to follow and get engaged with it. 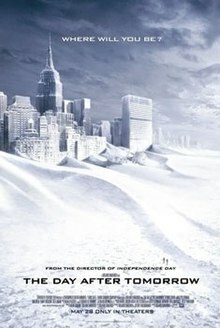 Because it mentions some of the issues of climate change, it is not only about warning the planet and using less heating, it is about changing the weather patterns dangerously, about changing ocean currents,… (OK it is not scientifically thought and can generate a confusion about climate change and ice age, but it is Hollywood and people know that films are not always accurate). And the last reason to like it to some extent, is that it is the most explicit commercial film clearly related with climate change, comparing with many others that are just subtly related, this is a great positive argument. Many times films are great door to more elaborated knowledge for many, many people and we need a lot of people interested in learning about climate change.